So with the iPhone 5S, Apple introduced a new 'Space Gray' color that is its new black. Not in that tired fashionista way where trends are considered the new black but in a completely literal way in that Apple is calling its black 'Space Gray'. 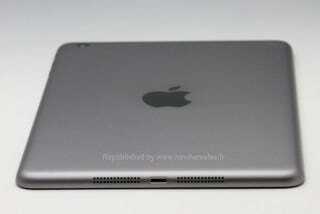 So maybe it's not surprising that a supposedly leaked iPad Mini 2 casing shows that it's also doused in 'Space Gray'. Currently, the iPad Mini comes in Black & Slate and White & Silver. That's the same color configurations as the now discontinued iPhone 5. Would it then make sense for Apple to make the next iPad Mini's colors (if this casing really is for the next iPad Mini) match the current iPhone 5S? Maybe?